Known for his “keen sense of timing, charisma, and leadership,” Henry Shin is steadily building a reputation as one of the most versatile conductors of his generation. Since 2015, Mr. Shin serves as Director of Orchestras at Pasadena City College. A strong proponent of bringing music to underserved youth in Los Angeles, he also serves as the music director and conductor of the nationally-acclaimed Harmony Project Orchestras, Hollywood, as well as the Valley Philharmonic Orchestra in Porter Ranch.. Mr. Shin also serves as the assistant conductor of the Elizabeth Mandell Music Institute (EMMI) Chamber Orchestra at the Crossroads School for Arts and Sciences in Santa Monica. Prior to his arrival in Los Angeles, Mr. Shin served as assistant conductor of the San Francisco Civic Symphony and with the University Symphony Orchestra at UC Berkeley. For almost 10 years, he served as music director and conductor of the UC Berkeley Summer Symphony. He has also been music director of the San Francisco Arts Education Project’s Event Players, a premiere children’s musical theater troupe, leading sold-out performances of Carousel, Guys and Dolls, Oklahoma!, and On the Town. In 2009, Mr. Shin gained international recognition when he was a prizewinner at the prestigious International Competition for Young Conductors in Besançon, France – notable alumni to include Seiji Ozawa and Osmo Vänskä. 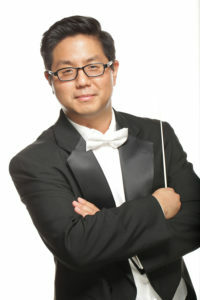 Mr. Shin has studied conducting with David Milnes, John Barnett, Carl St.Clair, and Neal Stulberg, among others. He has also worked alongside Kurt Masur, James Conlon, Marin Alsop, Gustav Meier, Daniel Lewis, and Stanislaw Skrowaczewski. In 2006, he received the Alfred Hertz Memorial Traveling Fellowship, allowing him to be a conducting apprentice at the Deutsches Nationaltheater und Staatskapelle Weimar in Germany. Mr. Shin holds a Bachelor of Arts degree from UC Berkeley, his Masters degree in conducting from the USC Flora L. Thornton School of Music, and currently completing his doctoral studies at the UCLA Herb Alpert School of Music.